If you have been watching the bodies of seasoned runners, you will notice their nicely toned body and much coveted six pack abs. If you have been running for some time now and still don’t have abs, you are probably wondering what the secret to getting those abs is. Does running give you abs? The answer may surprise you. Does Running Give You Abs? Getting rid of your belly fat is the first and very important step you need to take before you even start developing abs and running can indeed help you do that. The stronger your abdominal muscles are, the more reps you will be able to perform when you include strength training in your routine. The study compared the results of those who did 20 minutes of weight training and those who did the same amount of aerobic exercises. The results showed that although those who did aerobic exercises lost weight, their muscles continued to expand. This is because exercises such as running burns not only fat but also muscle mass. Just like running cannot automatically give you abs, it also cannot automatically ﻿﻿help you build leg muscle. In order to build leg muscle, you will need to complement your running by incorporating some leg workouts like squats, push ups, calve exercises, and hip raises. Gaining muscle is not feasible with running alone because of the lack of resistance as you run which is necessary in order to build muscle. 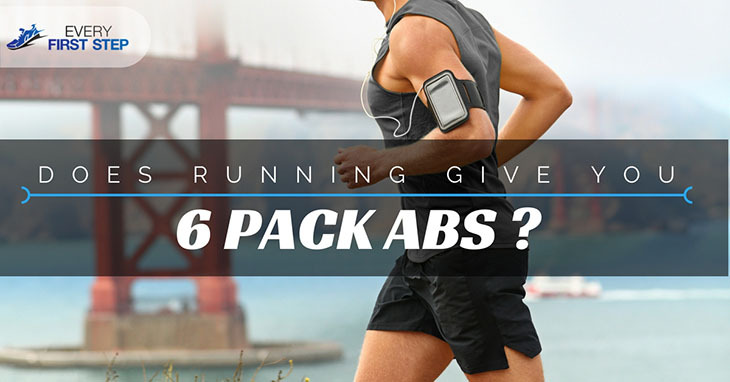 Although running alone cannot give you six pack abs, it can still play a vital role in helping you achieve your goals. The secret is doing the right kind of runs. According to researchers, it is much more beneficial to sprint for short distances than to jog or run a marathon for long distances. In one study (4) conducted in Sydney analyzed the effect of 8-second bursts over a 20 minute period. Such surges helped men to lose 4 pounds of fat over a 12 week period. In addition, a 17% reduction of fat around the internal organs was observed. You may also incorporate other strength training in between your sprints such as push-ups, high knee jumps, and lunges. No matter how much you work out, you will not get those abs unless you make changes in your diet. Generally speaking, try and reduce your carbohydrate, sugar and alcohol intake and replace them with protein-rich food, vegetables, whole grains and healthy fats. As we have mentioned earlier, doing solely aerobic exercises such as running will result in a loss of muscle mass. If you want to prevent this from happening, incorporate the basic strength and resistance exercise routines. The answer to the question whether running can give you abs is yes and no. If you only do running and have no strength training exercises incorporated in your routine, then no- running will not give you abs. However, if you select sprinting and combine this with proper diet and strength training, your running can greatly contribute to getting a six pack abs. Does Running Make You Taller? The Answer Might Surprise You!